Originally slated for release sometime before Christmas 2010, Valve and Aperture Laboratories LLC have decided to push the release back into 2011, because "making games is hard." No, really. 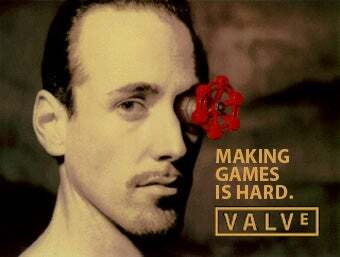 The news comes in the form of a press release titled, "VALVE ANNOUNCES MAKING GAMES IS HARD." That seems fair enough. I mean, I can't do it, and I've tried really, really hard. According to Aperture, the delay comes after an exhaustive ethics-review-panel-supervised release date restructuring process, indicating the follow-up to the "ground-breaking title that earned over 30 Game of the Year awards despite missing its original ship date" would not be ready in time. Worry not, Portal fans. The combined companies assure us that the delay is safe, that "all life on earth won't instantaneously stop as every molecule in your body explodes at the speed of light, which is what would happen should a rip ever appear in the fabric of Valve Time," and that this will make the game even better, "missing an historic opportunity to create the first product delay press release to mention that a product is being delayed to make it worse." This is also not the Portal 2-themed surprise planned for E3 2010. Just a regular old surprise.